Circles are super easy with a walking foot. 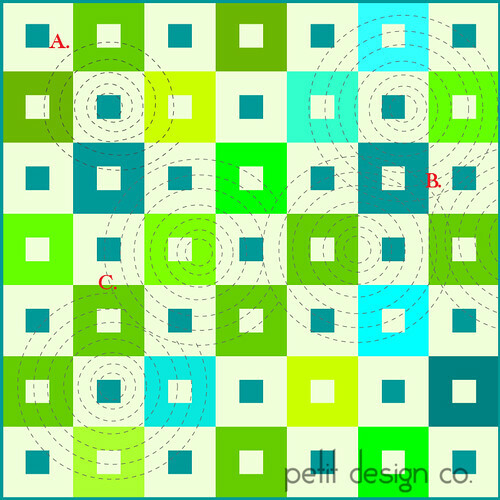 Circles add so much movement to a quilt and soften a “rigid” quilt pattern. The larger the circle is, the less pivoting you will have to do. Target:Each circle in this design is stitched separately. That means that you will have to tack your stitches every time you start and stop a circle. To save time you don’t have to stop and trim your threads every time you finish a circle. Simply raise your needle and presser foot, move the quilt over an align your self with your previous line of stitching, lower the needle and the foot, tack your stitches and quilt the whole circle. Once you are done with the whole quilt you can go back and trim the threads between your circles. The great thing about this design is that you only have to mark 1 circle. Don’t even worry about marking the teeny tiny circle in the middle. Simply find a large circle in your home, (like a dinner plate, a glass lid to a pot, or a coffee can) carefully center it on your quilt and mark the quilt top. Once you have stitched this first circle you can then work in to the center from it and out from the center of it. Don’t forget to play around with this design, you can get a more organic and whimsical feel by varying the spacing between the circles. A) Snail: You can always turn the design into a spiral and you won’t have to start and stop at all! To mark this design use a small round item to guide you in marking the first spiral (like a cup, a spice bottle, etc.) Once that first spiral is marked you will just follow your stitching lines. C) You can quilt “targets” and NOT let the outer rings cross. You would start with one “target” then start another one a little ways away. Once that second “target” is going to run into the first “target” you can start and end the rings where they intersect the first “target.” You don’t have to make all of the “targets” have the same number of rings. You can make small, medium, and large targets. Have you ever considered quilting circles with a walking foot? Are you willing to try them now? I love this idea! Do you have any pictures saved of quilts that are machine quilted like this? I am really enjoying your posts on machine quilting. I have a project all sandwiched and ready to try one of your straight line designs. Wonderful tutorials! Love this Idea! Can't wait to try it. I have a strip quilt that I think this will look awesome on! Wow! I am ready to try circles now! You make it seem easy! I quilt in the ditch all the time and am excited to try the new techniques you are teaching me! I have been trying to think about how to quilt a particular top I have sitting on my table and I think you have just solved this for me. I'm still a bit scared, but I think I'm going to give it a whirl! These are great ideas. I have really enjoyed reading your series of tips for quilting and look forward to reading more. I just today found your series on quilting with your walking foot. Thanks so much for all the good information! I wanted to do circles on a quilt and didn't know how - duh! Now that I know, I see it's very easy. Anyway, I have a quilt that needs quilting and I love this target design for it. It looks like it will be so much fun! Slowly working up the nerve for circles :) this post helps. I love to quilt and am a beginning free motion quilter mostly because I enjoy curves and designs. I have never used my walking foot because I don't know how to use it for anything but straight lines. How do you get the walking foot to curve? I've just begun to quilt and your posts are the best that I found. Thank you for sharing with us. Walking foot is making me feeling more confident to quilt. I did a few quilt in a spiral and just loved the way it looks.